Ideally, we use Skype for audio and video chat between two contacts. You can also use Skype to talk with more than one person or multiple contacts. For this you need to setup and start a conference call. Please note, only audio conference call between more than 2 contacts can be done (video calls do not work in conference call mode). 1. Launch Skype program & login into your Skype account. 3. 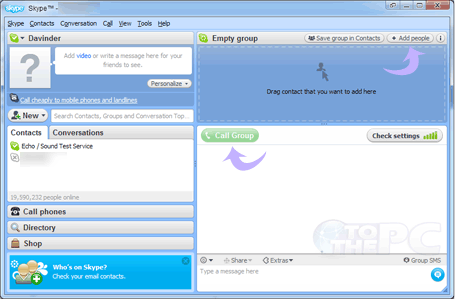 Drag & drop contact names from left side bar to ‘create group’ window at top right. Alternatively, you can click ‘add people’ button at the top of create group window to manually select and add contacts to group. 4. Once contacts are added for audio conference call, click the green call group button to start the call. 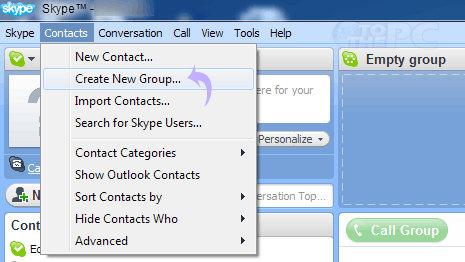 If contacts group is already created, you can simply click ‘call group’ button to start audio conference call. Also, during live two party audio call you can add more contacts to the call by going to Conversation > Add people or directly clicking ‘add people’ button. Download Skype 4.0 Beta 2, Compact View is back !